PicturesOnGold has Back to School jewelry with a purpose! You will safer sending your kids to school, or on field trips knowing that their wearing safe jewelry. Safe how? 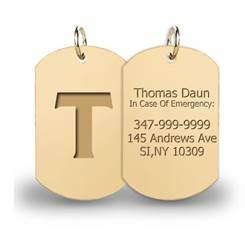 Emergency contact information is imprinted on the back of the medals! The necklace looks pretty and practical for wearing, but on the back has the information needed if the student were to become lost or ill. They come in a variety of shapes that work great for both boys and girls. I have worked with Pictures on Gold in the past and they always amaze me at the swiftness of their delivery! They work accurately and quickly to get your product to your door ASAP! I chose for my daughter to review this necklace. We had an S put on the front, and I chose to simply have our phone number rather than address. There is room for both if you prefer. She loves wearing the necklace to church and when we go out and about town. It simply looks like a Monogramed initial necklace, but she knows her Mom's phone number is on the back if she were to get split up from us. Pictures on Gold also has Guardian Angel Protect Me jewelry. They have double sided medals, guardian angel pendants, pins, the beautiful children's photo lockets, all to protect children. Enter to win a K.ID. Pendant and chain from Pictures on Gold! I would choose a Heart with a C.
I would pick the dog tag with N on it. "Back To School" Initial Heart Pendant with a R on it. I would pick the heart shape and the letter I.
I would get the heart and the initial "S" for my oldest daughter. I would probably get a heart with a "J" for my younger daughter, because she will want one too! Great idea! I would choose the heart and an A.